Hello I"m back. It has been awhile as I find very little Canadian or English Militaria in Central Florida. When I do it always goes on this fine forum first. Some of you know me as I have over 2000 posts on "U.S. Militaria Forum". I'm not sure what the engraving on the back represents but the front enamel lettering is RFC for Royal Flying Corps. 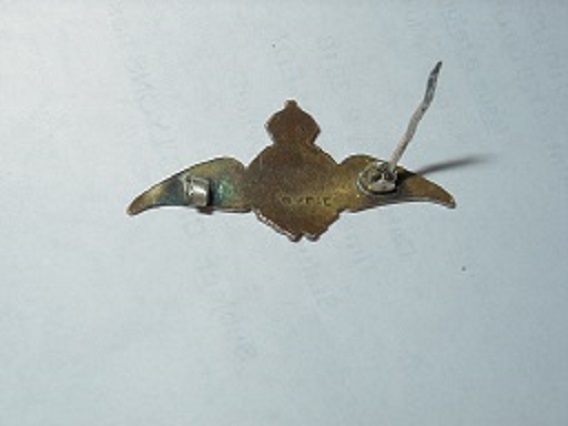 Brent W wrote: I'm not sure what the engraving on the back represents but the front enamel lettering is RFC for Royal Flying Corps. 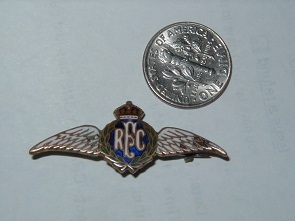 What you have is a RFC Sweetheart pin, these pins came in many sizes and could be obtained for most Corps and Regiments during both wars. 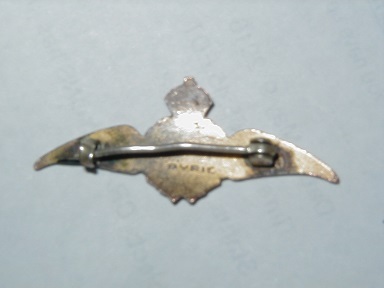 The manufacture's name is embossed on the back of the pin. Thank you Ed. You always answer my questions, sure is a funny looking F. Ha HA - I guess this old Yank can not read fancy script. Hope this finds you well. Since it is not Canadian is it still OK to sell here and is $20. about right? Thanks again Richard the old retired guy in FL.